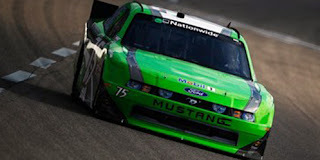 Johnny Chapman picked up the 13th last-place finish of his NASCAR Nationwide Series career in Saturday’s Nashville 300 at the Nashville Superspeedway when his unsponsored #75 Rick Ware Racing Ford fell out with a vibration after completing 1 of the race’s 225 laps. With the finish, Chapman is now tied with Ed Berrier for the third-most last-place finishes in Nationwide Series history. He has also equalled Kevin Lepage’s mark of 22 finishes across all three of NASCAR’s top divisions, sixth-most all-time. Like TriStar Motorsports, Rick Ware’s Nationwide Series program has been fielding three cars this season. The #41, shared by Patrick Sheltra, Carl Long, and Jennifer Jo Cobb, has made all eight races this season. The #15, which made its on-track debut with short tracker Timmy Hill at Phoenix, has made every race since. At Texas, Ware debuted an unsponsored third team, a #75 which exited the race after three laps with driver Carl Long. The #75 finished 42nd that night, edged by one lap for last place by TriStar’s Jeff Green in the #44. Nashville would see the #75's second start of the year, this time with Johnny Chapman behind the wheel. With just 43 cars showing up to the concrete track, Chapman was guaranteed his 101st career Nationwide Series start. It would be his first since he finished 37th in Morgan Shepherd’s #89 during the final series race at Gateway last October. Chapman, who finished next-to-last in Nashville’s truck race the night before, qualified 38th for the Nationwide event at a speed of 149.495 mph. Just like Texas, however, he and the #75 would leave the race early. This time, Chapman followed Jeff Green to the garage area after both completed the opening lap. Since Green, who qualified five spots ahead of Chapman in 33rd, was still ahead of him that lap, Chapman ended up with the last-place finish. This ended Green's streak of two consecutive 43rds from Texas and Talladega. Carl Long raced for Ware as well, returning to the #41, but fell out of the race after three laps. Timmy Hill and the #15 came home 33rd after a blown left-front tire tore up the fender on his Ford. *Chapman had not finished last in a Nationwide Series race since 2010, when his #92 K-Automotive Motorsports Dodge fell out three laps into the 2010 Scotts Turf Builder 300 at Bristol. It was Chapman’s only last-place run with K-Automotive in 2010, a year that saw the three-car team score a Nationwide Series record of 13 by season’s end. *This was Chapman’s second career last-place finish in a Nationwide Series race at Nashville: he and the #90 MSRP Motorsports Chevrolet fell out 15 laps into the 2009 Nashville 300 with brake troubles. *The #75 had not finished last in a Nationwide Series race since 1998, when Kelly Denton’s Food Country Chevrolet lost the engine after eight laps of the 1998 Food City 250 at Bristol. The number had never before finished last at Nashville. It was Denton’s one and only last-place finish in 36 series starts.